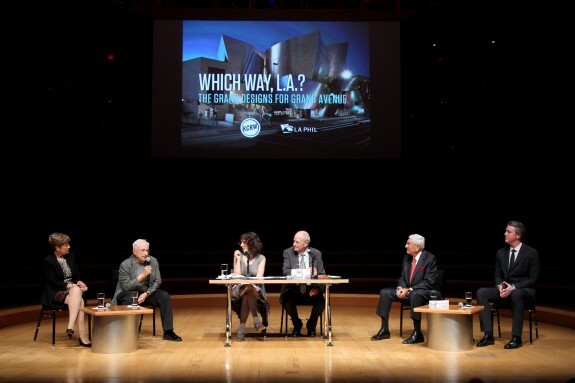 Last Wednesday, October 2nd, KCRW and the LA Phil marked the tenth anniversary of the Walt Disney Concert Hall with a panel discussion in the hall, featuring architect Frank Gehry, businessman-philanthropist Eli Broad, LA Times architecture critic Christopher Hawthorne and Deborah Borda, president and CEO of the LA Phil. The evening was introduced by Mayor Eric Garcetti. But that version was sent back to the drawing boards after Los Angeles County Supervisor Gloria Molina and the Grand Avenue Authority surprised developer Related Companies last week by ”severely criticizing and temporarily rejecting its plan for a retail complex crowned by hotel, apartment and condo towers.” They criticized the scheme ”as uninspired and overly commercial,” reported the LA Times. 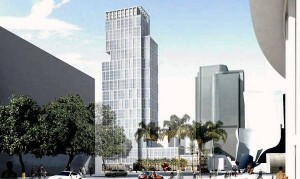 After that vote, it looked as if the project might collapse altogether. 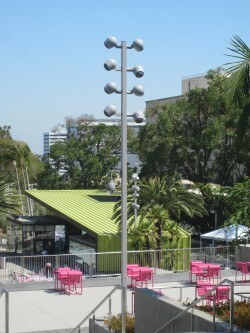 Just this week, the American Planning Association (APA) designated Grand Park, designed by Rios Clementi Hale Studios, as one of its ten ”Great Public Spaces” in America. 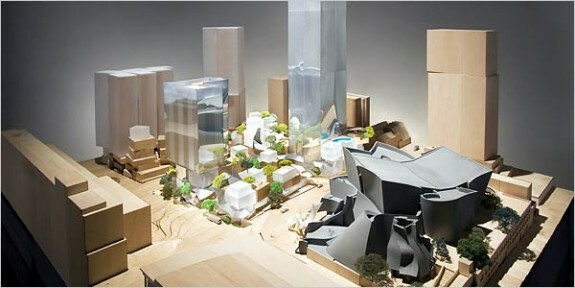 For fascinating background on Grand Avenue, from the fact that it used to be called “Charity Street” through to plans of the signature developments for Bunker Hill dating back to 1950, that never got built, check out “Grand Illusion,” a book based on a research studio at USC School of Architecture that I conducted with students and partners at Frank Gehry’s office. Reprinted from the DNA blog.